So I wanted to do some more décor for Easter than my standard bunnies. I love them but, I also wanted, I guess, something more sophisticated. I have this empty apothecary jar in my guest bathroom that I still haven’t quite figured out what I want in it permanently. So I had this fun idea…a nest full of eggs. So with some existing supplies and $3 worth of some extra supplies, I was able to create a cute and more sophisticated Easter décor. Granted it’s going in my guest bathroom…maybe it will find its way out elsewhere. 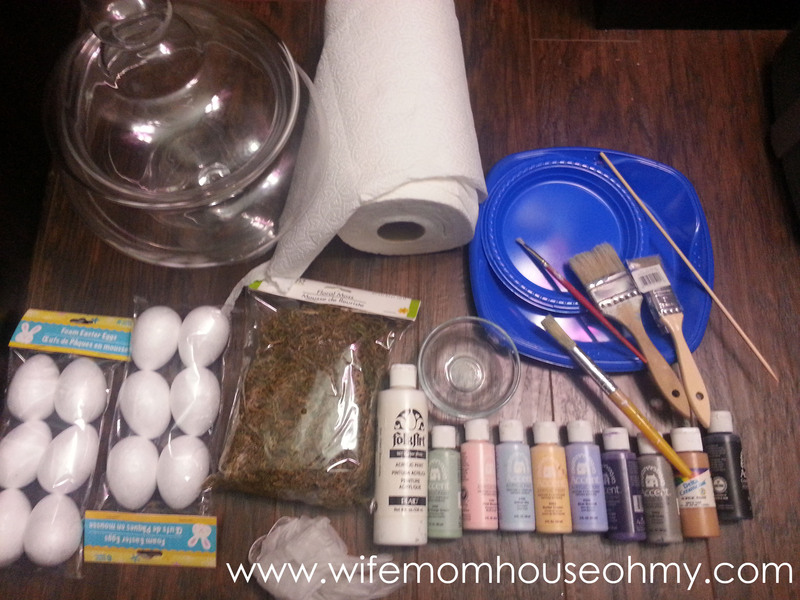 I had most everything lying around my house and within my craft supplies but I went to the Dollartree to purchase a bag of craft moss and two packages of foam eggs – six in each. Total cost $3. 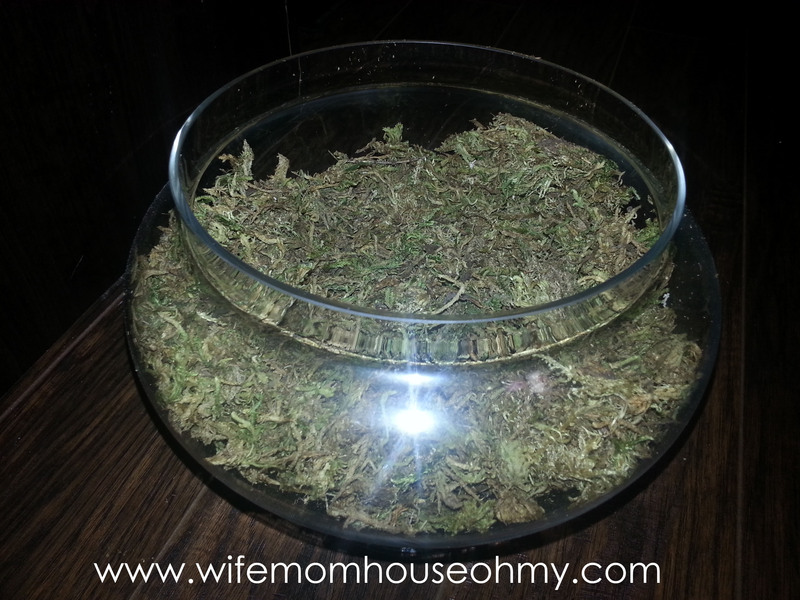 Fill the bottom of the apothecary with the craft moss. I created a small “nest” hole in the middle for the eggs to sit in. I set this aside to create the eggs. I wanted to pick the shades for my eggs so I bought foam eggs. 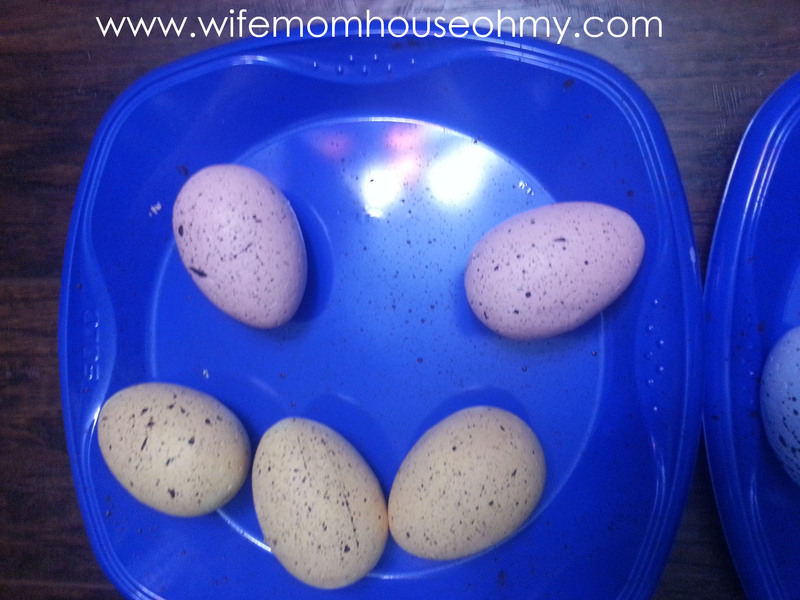 You can also use wood eggs but they generally cost more. 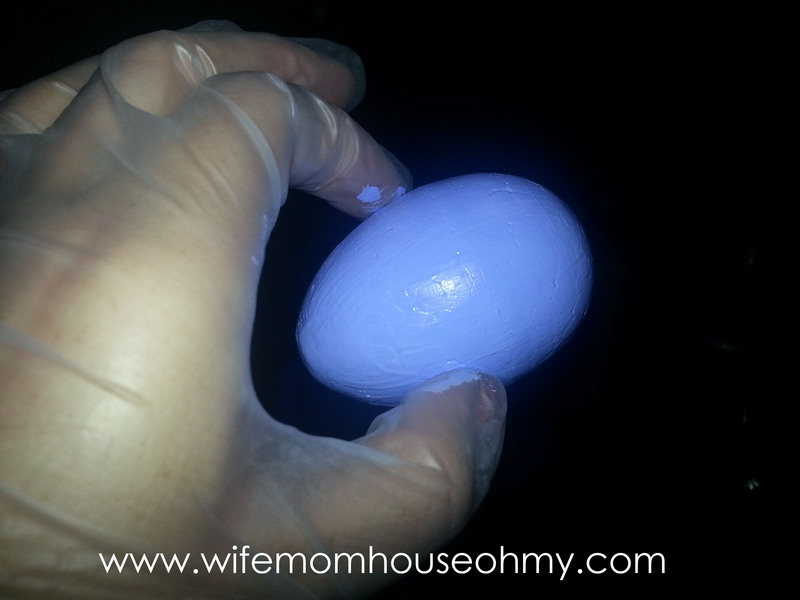 If you don’t want to paint the base color, then you can get some pastel fill yourself plastics Easter eggs. Make sure they are solid, no holes, and I recommend that they are not the hinged kind. If all you can find is the hinged type, just make sure the hinge gets buried in the moss. Anyways, I selected five colors and painted the eggs. 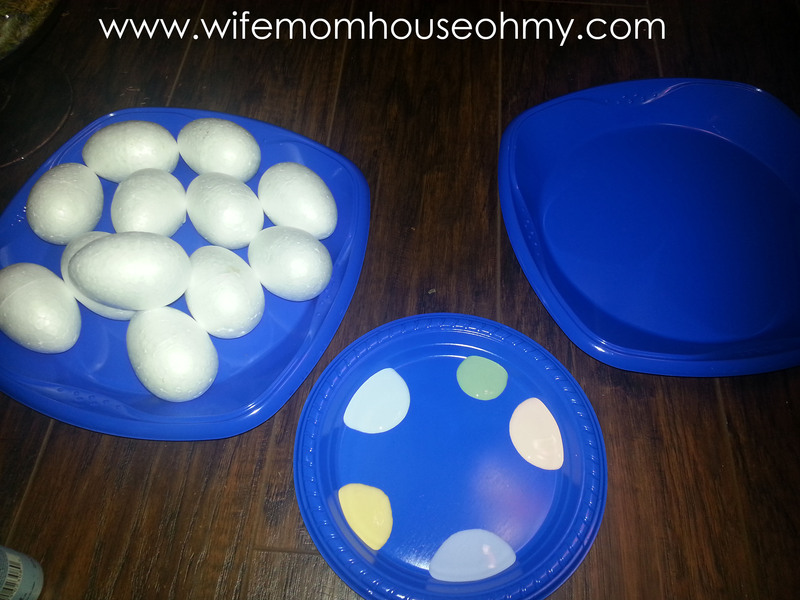 I used the small plastic plate as my palette for my paints and the large ones to create drying trays. I choose to only do one coat of paint since I wanted a more mottled look. Real eggs don’t look perfect so I wasn’t worried about them looking perfect either. However, if you want a more solid color, add a second coat. Either way, let them dry. 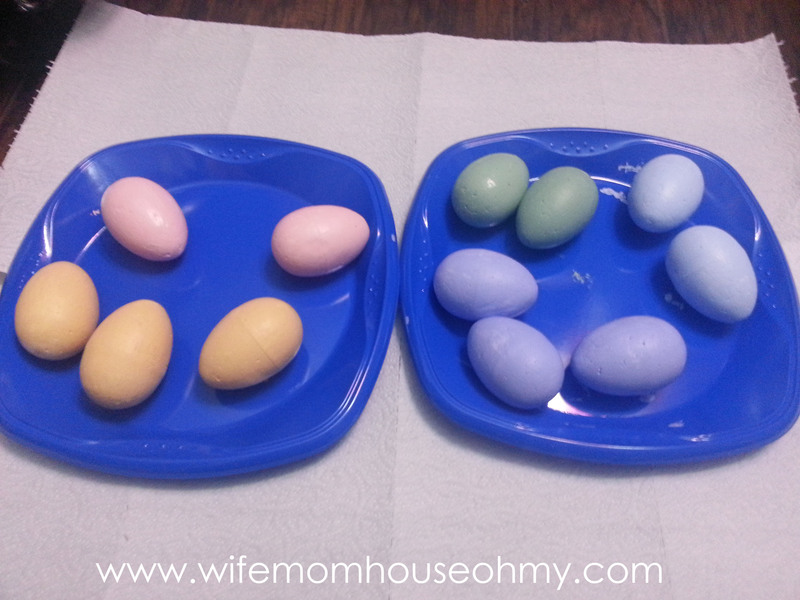 Once dry, I wanted to add the speckling that is is typical of robin’s eggs. 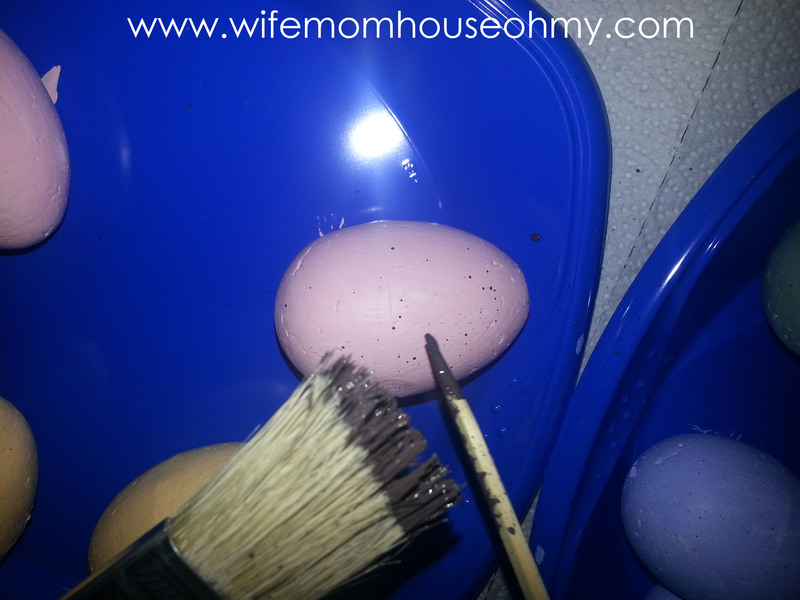 To do so, I used brown paint and splattered it on the eggs. I did this by dipping a flat brush in the brown paint and then running the skewer back and forth over the bristles. If you do this method, make sure that you cover a larger area with paper towels as the splattered goes far. The most important part is to let the brown speckles fully dry. If not, they will smear. The final step was to put them in the nest. 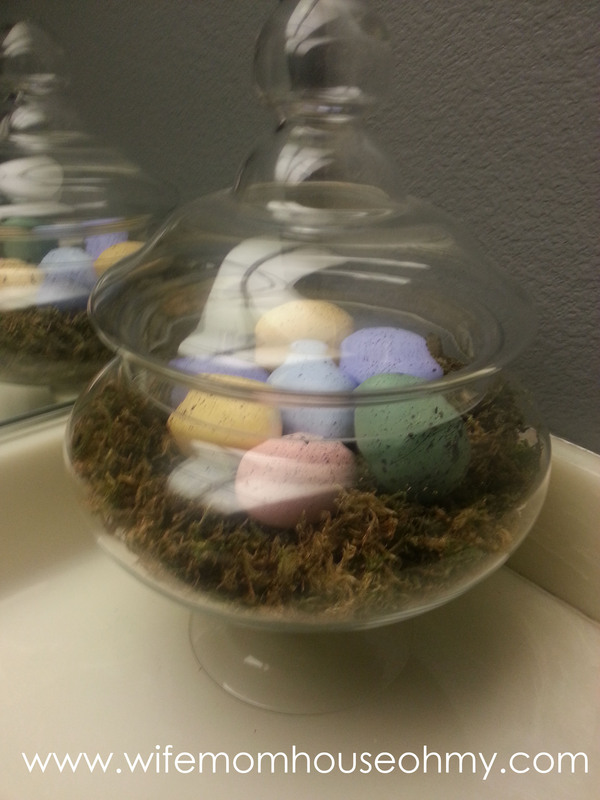 I used the extra eggs as decor around the bathroom. Pretty simple and easy and fast. The hardest part was waiting for everything to dry. But the actually work only took about 30 minutes. I think it came out nice and adds a more sophisticated touch to my Easter décor. 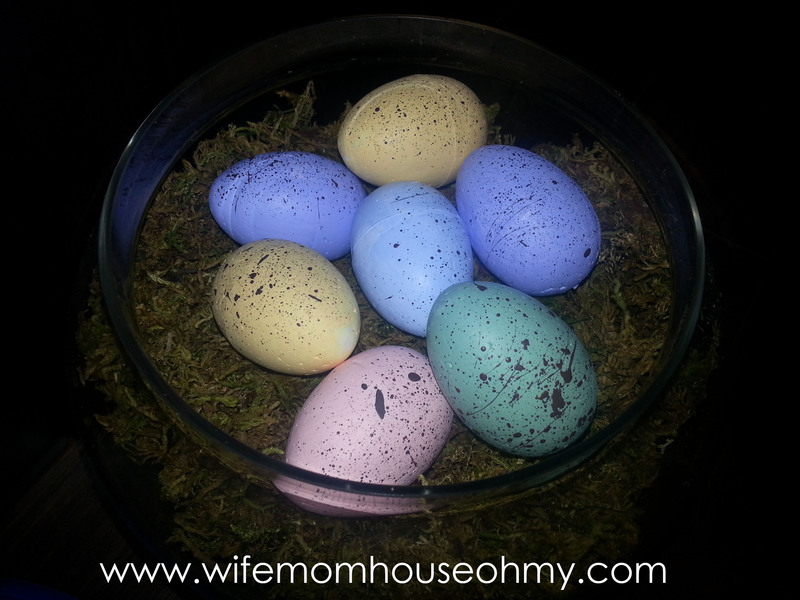 Pingback: Inexpensive DIY Apothecary Jar Easter Décor | Wife, Mom, House...Oh My!